March 11 & 12, 1988. 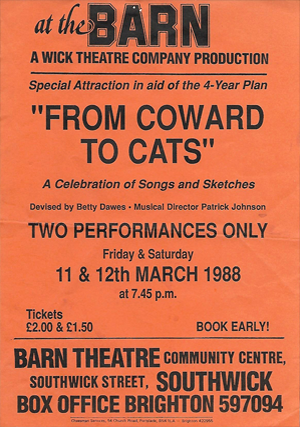 Note from webed: This two-nighter was inserted into the programme as a ‘Special Attraction in aid of the 4-Year Plan’. “What a success this was despite having been put together very quickly and rehearsed over a very limited period of time. My sincere thanks to EVERYONE who was either in it, backstage, front of house or in the lighting box, box office or workshop. I really appreciate support I was given.